“Greece has decided to send a message to the east and west, towards all our friends and not, that whoever is violating the principles national sovereignty and respect towards us, measures will be taken. The time when it was considered diplomacy to turn a blind eye has passed,” Foreign Minister Nikos Kotzias said on Sunday in an interview with the Athens-Macedonian News Agency (ANA). Asked about the tension that exists in recent days in Greek-Russian ties, and the possible cancellation of the Russian Foreign Minister’s visit to Athens, Kotzias said that he is not worried and expressed his hope that any problems will be resolved in a friendly way. “Sergei Lavrov, whom I consider to be one of the best diplomats on the international scene, and I have a friendly relationship, asked me to invite him. To come to Greece to prepare for the trip of the Prime Minister Alexis Tsipras to Moscow, who was invited by them. I gave this invitation. If he wants to come, he will do so, again he will be welcome. If he feels that he must align with those that we expelled or with those that were not allowed to enter, it is his right. I tried, as you know, and it is highlighted in the announcement, not to link these bad cases with formal Russia. It is an issue for Russia if it wants to identify link with them or not,” he said. Kotzias said the fact that Greece’s opposition parties kept low tones on the issue and were careful in their statements as regards the Greek-Russian ties was “very good”. 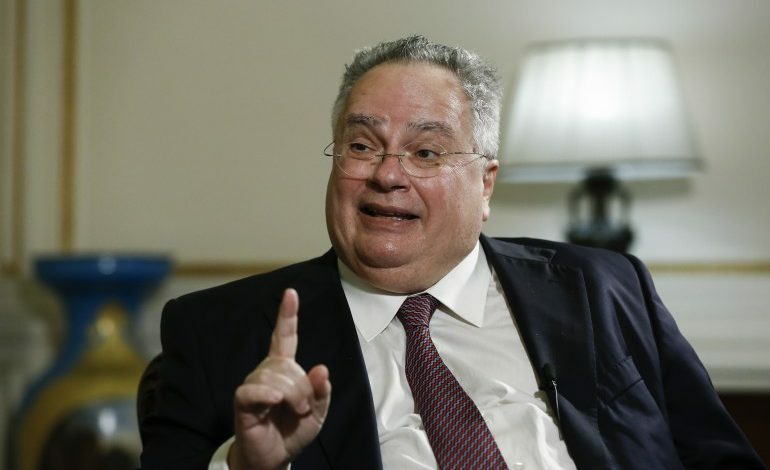 Regarding the Prespes agreement, Kotzias said that the conditions were mature for a deal. “They claim that we rushed. The conditions were mature. When the conditions are mature, it means that you must proceed with what you what you can do,” he said. “Secondly, we had to deal with a fait accompli which must be taken into consideration. What we managed to do was to correct some things in the best possible way. But, the continuation of the state is a basic principle of the international law,” he added. Kotzias stressed that compromises are required in a negotiation. “But we managed to gain the abolition of irredentism, the recognition of the borders, the recognition that there are no minority rights in Greece and claims, recognition that they must change their name to Northern Macedonia, recognition that this should be for all purposes, recognition that they should make constitutional changes,” he stated. More than 40 intellectuals from Europe and the United States in an open letter published in the British daily newspaper The Guardian are seeking the historic agreement of 17 June signed between Macedonia and Greece, which ends the name dispute, to be implemented. “The historic agreement of 17 June signed between Greece and the Former Yugoslav Republic of Macedonia (Fyrom) ends a dispute that had been festering for the last 25 years (Report, 19 June). It defines the political, historical and cultural boundaries between classical Greek Macedonia and – as of now – North Macedonia, by making it clear Macedonian identity can be shared between people who endow it with different meanings. It respects the dignity and the right to self-determination of the two peoples and confirms the desire of both countries for peaceful coexistence. Each side has had to address the concerns of the other. For Greece, the geographical designation in the compound new name (North Macedonia), its application domestically and internationally, and the requirement that the constitution of Fyrom be amended accordingly. For North Macedonia, acceptance of the existence of a Macedonian language as part of the Slavic family of languages (a fact long recognised by the UN and Greece), the designation of the nationality as Macedonian/citizens of North Macedonia and, crucially, the promise of starting accession negotiations to Nato and the EU. But the agreement still faces big hurdles in both countries, where hardliners and extremists are mobilising against it. North Macedonia’s government, in particular, desperately needs for all parties to fulfil their promise if it is to win the ratifying referendum in the autumn.